Description: Decumbent to spreading shrub to 60 cm high; stems wiry to trailing, pubescent with a few simple or stellate hairs. Leaves generally oblong to oblanceolate, 5–7 mm long, 1–3 mm wide, apex ± rounded, rarely mucronate, base tapering, margins recurved to revolute; hairs often soon wearing off both surfaces, upper surface with simple and stellate hairs, lower surface with scattered simple often hooked hairs and stellate hairs usually restricted to midribs and near margins. Flowers terminal, solitary, or rarely 2 flowers terminal; peduncle 2–10 mm long. Sepals 3–5 mm long, outer surface pubescent. Petals 3–6 mm long. 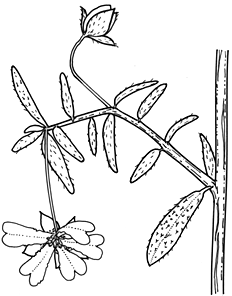 Stamens 5–9, on one side of carpels. Carpels 2, stellate-hairy. Distribution and occurrence: In woodland or sclerophyll forest, scrambling over other vegetation.